The Most Overlooked "Basic Need" itle came about by me wondering what I would do after the poo-hit-the-fan, if I didn't have soap or hygiene products - which for me just happen to be purchased at a Cosmetic Counter in the past. Most of us (hopefully), to some extent, have preparedness provisions set in place for our basic needs; such as emergency water, survival food, home and personal protection and shelter, but like I said, the one area that seems to be lacking, and yet is considered to be one of the most crucial, is personal hygiene. In this book you will find that even though you no longer have access to toothpaste, soap, body wash and shampoo due to some catostrophic event; you can make them. Keep yourself clean by making your own toothpastes (poor oral health can lead to strokes, heart attacks and coronary artery disease), body cleaners, shampoos and conditioners (not washing your hair can cause scalp disorders & diseases) - all using items from your pantry and garden. Make body lotions, scrubs, creams, and moisturizers; and yes, you can even create make-up products like foundations, blushes, eye-shadows, mascara, eye-liner, lip-sticks and glosses - all with items you currently have or could easily have access to in your pantry and garden. Learn how to cut, trim and style your own hair and that of your loved ones – most of us are have our hair trimmed here and there. Knowing how to avoid looking like a castaway will go far in boosting morale. When the poo-hits-the -fan it will be critical to keep yourself as clean as possible. You may or may not have access to water. Thankfully with the help of this book you have options. The book also contains health tips and facts, like how to safely remove an in-grown hair or care for blemishes and why they occur. Think about this, we may not have the storage space to load up on cases and cases of shampoos, soaps and toilet paper. If you could save yourself from having to buy a bottle each of shampoo and conditioner or any grooming-aid for that matter, it would more than pay for this jam-packed 272 page book full of remedies to keep you and your family clean (before and after) the poo-hits-the-fan. Men, as head of the household, your family will look to you for guidance in this area - what will you say when they ask what they will bathe or shampoo their hair with? A big part of preparedness is hygiene. Prepare you and your family NOW for whatever may come your way in the future with this "how-to" for the basic need of emergency/survival hygiene. 5.0 out of 5 stars Such (girly) FUN! By Donna L. Miller I have to say...I really enjoyed this book! Being a long time 'earthy' person I knew some (not all) of the cleansing, upkeep and care recipes (but sure learned a few new ones from you to add in now!) BUT.... I did NOT think about the makeup parts (face-palm). Suffice it to say, that chapter is my favorite! Thanks for the fun approach and personal touches, SJ. Loved reading this book! This is a great book to use not only in a SHTF time but also when you forgot to get what you needed at the store. So just do your own. My wife really loves this book and is trying out everything to BE PREPARED. When the wifey feels good the husband feels good. We may not be going to the cosmetic store anymore (I hope). LOL!! Love this book. It's a excellent and easy-to-understand guide for grooming, hygiene and maintaining a sense of health and well-being during and after a disaster. But the broader message is that we can actually reduce our dependence on store-bought products by becoming more self-sufficient and making our own healthcare products. Why? Because its easy, we can save money, it's healthy and more natural, and because it allows us to take back some control over what we use on our body. And guys don't let the title fool you, although your wives, girlfriends, mothers and daughters will definitely love this book, so will you. It's not just about cosmetics, there's a lot of information for the guys too - from shaving, to foot care, hygiene, etc. Highly recommended and written in plain English. A excellent addition to any self-reliance library. Women spend a fortune on cosmetics to try to stay beautiful. I know my wife should own a major share of most cosmetics companies! I'm getting this one for her! Twitter's Prepper "Wonder Woman" Survivor Jane has done an outstanding job of putting together a resource for women that will help them stay attractive without spending a fortune, even after the proverbial "poo" hits the fan (as Jane so politely puts it). She has put together a list of botanicals, oils, fruits and other ingredients that, when combined in her easy-to-understand recipes, become facial washes, facial masks, hair color and other beauty supplies the woman in your life can make in her own kitchen. It seems it doesn't take a chemistry lab and a bottomless bank account to create beauty aids that help a woman feel more "gorgeous"! It only takes this wonderfully simple to use book by Survivor Jane! 5.0 out of 5 stars What a wonderful book By grannie prepper "Starving Artist"
Justgot this book and was amazed at the wealth of information contained inside. This book would be good for people who are prepping and also for people who are living on a limited budget. I can see myself trying lots of the recipes. I think that this is a book that everyone should have on their bookshelf because you just never know. Prepper, Mom and Teenager Approved! I have been anxiously awaiting the release of Survivor Jane’s new book ‘Where There is no Cosmetic Counter: How Not to Look Like a Zombie – Even After the End of the World As You Know It’ I instantly realized this book is not just for the preparedness minded. It is a wonderful resource for ALL females of ALL ages, especially those who have concerns about the ‘stuff’ that they put in our everyday lotions and potions. So attention prepper chicks; homesteaders; self-sufficient and ladies of ALL classifications, you will LOVE this book! I would also recommend this book for men; there are several sections that would be useful for the ‘guys’ in our lives. (Not just for their own personal use but as an insight into things that you might have to deal with for the ladies involved in your preparedness plans). Most of the recipes SJ uses include everyday items that we have in our home. Yes, there are a few extra things that would be nice to have on hand but I have made my wish list and will be picking up those items over the next few weeks. I too will be the ‘mad scientist’ creating and concocting some wonderful daily and prep related health and beauty aid products. I figure what I pay for 1 good bottle of fancy-shmancy moisturizer I can get a hardcopy of the book and the few other things on my wish list and be set for a VERY long time! One of the first things I learned was coconut oil is my new best friend, I can cook with it AND moisturize! SJ does a beautiful job of describing and including easy-to-understand instructions. I joke about being ‘domestically challenged’ but seriously if I am given good instructions I can do it, therefore you can too. She also handles that ever so dreaded topic of feminine hygiene very eloquently….. It’s not fun to think about but we have to. This wonderful resource will hold a very special place in our personal library and used frequently! Thanks Survivor Jane! I had looked forward to Survivor Jane's first book and could hardly wait to begin flipping through the pages. Even my teenage daughter and non-prepper friends are lining up to borrow the book. This book will appeal to not only prepper chicks, but those concerned about using potentially harmful chemical and synthetic ingredients in the beauty and cleaning products - as well as frugal folks who want to keep their beauty, health, and cleaning costs to a minimum. "They say that cleanliness is next to godliness. If that's the case, consider this the prepping book you'll need to remain godly in a true survival scenario! In a conversational and humorous tone, Survivor Jane tells it like it is in her debut book, "Where there is no Cosmetic Counter". From the great supply list in the beginning, to the practical ways to make anything from shampoo to face wash to make-up (yes, make-up), Jane includes it all in this how-to manual. 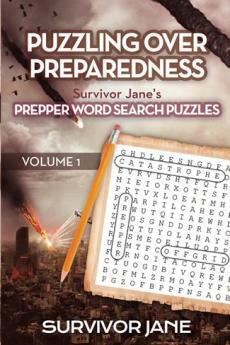 It's a must have for your prepping library...especially if you want to impress that prepper-lady in your life!" 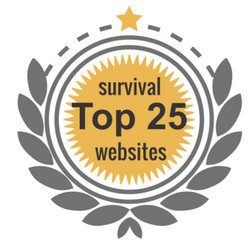 a new prepper or an old crusty "survivalist," Survivor Jane is someone you need to follow. She is in it to help others learn to be more prepared and self-reliant. it takes a woman to think of things like replacements for commercially produced toothpaste and oral care products. Think of it: If there are no dentists available and suddenly you or someone in your family has a dental issue, it can be a big problem. Survivor Jane's book is chock full of items that you can make with everyday household ingredients. Things like toothpaste and mouthwash will be critical for preventing dental issues, for example. The book is also full of things I didn't know, such as "oil pulling" for oral hygiene. This book is not just for use after a long term crisis - there are many replacements in Survivor Jane's book for the expensive and chemical laden products that we use today. So whether you are looking for alternatives when you can no longer get the products you presently use - or you're looking to replace products you presently use with more natural alternatives, this book is for you. It is true: Survivor Jane can show you "how not to look like a zombie - even after the end of the world as you know it." If the every day health and beauty products you are used to are no more, there are natural, easy to make and effective alternatives. This book is a gold mine of ideas and practical solutions - some of which you might want to try now if you are looking for more natural alternatives to your current (expensive) commercial goo. Bottom line: Survivor Jane's Where There is no Cosmetic Counter belongs in your preparedness library.